Eggs: Laid in bird nests or on structures close to roosting birds. Hatch in 1-2 days. Nymph: Two moults to adult, and can reach the adult instar in under a week. Adult: Adults can live for up to a year and survive for several months between blood meals. 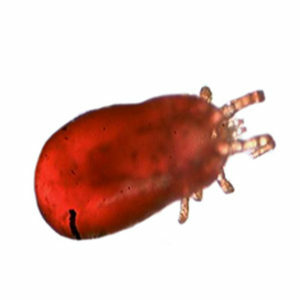 Poultry mites are eight legged and vary in colour from tan to dark red dependant on when the last blood meal was taken. Adult size is on average 0.7mm. Found throughout the UK outdoors, it infests wild bird nests. More recently becoming a greater pest of poultry rearing facilities both domestic and commercial. Heavy infestations can cause severe debilitation of the birds, making them flighty, more prone to feather pecking and in extreme circumstances can kill the birds outright. Lowered egg production rates and marking on the eggs from crushed mites is another sign of infestation. 1. The British Pest Management Manual. Section 5, pg 201.